My four-week e-course will teach you how to craft truly beautiful letters. Letters that deliver joy, and are destined to become keepsakes. You'll gain new writing and storytelling skills, ideas and tutorials for mail-art and thoughtful gifts, a guide to finding pen-pals, and time-management tips for busy correspondents. It's also packed with bonus printable resources. Enjoy colouring-in for relaxation and creativity, while creating something unique and beautiful to share with others. There are 60 downloadable illustrations, each designed as an envelope-template. When you have finished colouring, follow the instructions to turn your art into an envelope, and make somebody's day by sending them a unique letter! Coming soon! The Art of Mail: a field guide to creative, quirky and kind projects in the post is the working title of the book I’m writing and illustrating right now. It is about all the clever, kind, quirky and creative things that people are doing (and YOU can do) with the post. The book will be available as an e-book, and in limited-edition print format, in 2019. I have been collecting recipes, received via letters from all over the world, to create a special kind of cook-book. The book will be a celebration of food, nostalgia, hand-written communications and community all in one go. I've collected all the recipes, and special stories, and now I'm in the process of bringing this collection to life. Follow along to see recipes. 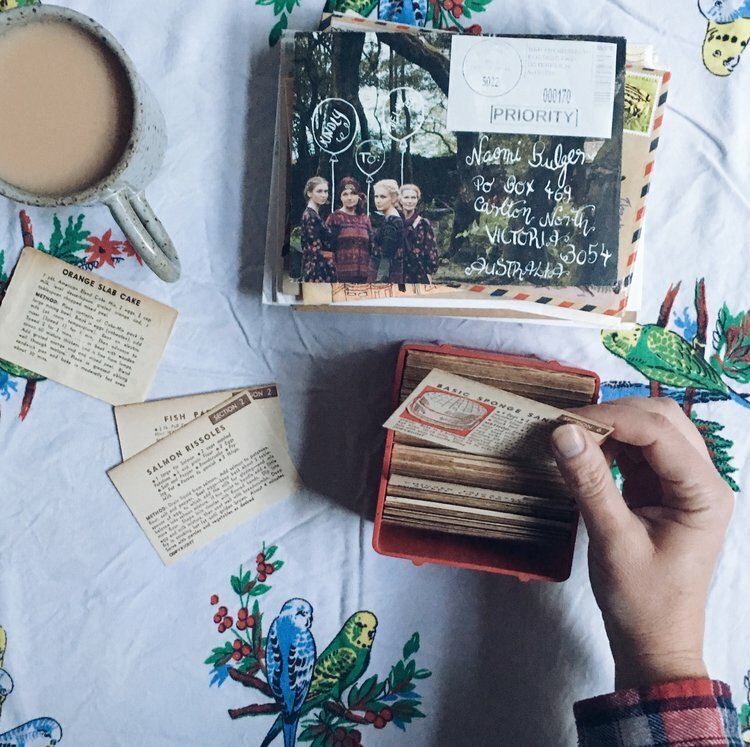 “Mail art” is an artistic movement all about sending small-scale art through the post. It started in the 1960s and 70s within the “fluxus” movement, which was an anti-art, anti-establishment movement that aimed to challenge the very definitions of art. So, for example, it asked: “Can mail be art?” Well, the answer is yes! This is an ever-growing gallery of the mail-art I make.